Collecting Japanese Meiji Period Satsuma Pottery – What to look out for? Satsuma pottery is the Western name for very collectable type of Japanese earthenware exported throughout the world since the Japanese Meiji period (1868-1912). It is named after the Satsuma provinces, but was made in many parts of Japan, notably in Kyoto. Japanese sources suggest the Satsuma pottery tradition dates from the 17thC, but firm identification of any pieces earlier than the 19thC is difficult. Kilns were established in the Satsuma area in southern Kyushu by Korean potters in the late 16th century. The first and very earliest wares are the rarest of the rare and were stonewares covered with a thick dark glaze. 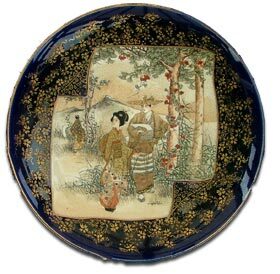 During the mid 19th century the pottery that today, is recognized as satsuma pottery ware was created. Some of the finest pieces of Satsuma pottery were manufactured c1900. It is a slightly yellowish earthenware. It’s glaze has a fine crackle and it does not ring when tapped. Decoration, was sometimes carried out by a second workshop and varies from mass-produced broad designs to exquisite miniature scenes finely enamelled and gilded. Satsuma wares were first developed in the Satsuma Han and produced, mostly for export to the West, in cities such as Kyoto, Tokyo, Nagoya and Yokohama. The circle with a cross that often makes up a part of the Satsuma pottery base mark is the Shimazu family crest. They ruled Satsuma Han. Satsuma Gosu Blue was produced in a very limited quantity in Kyoto in the mid-19th century, and is now the most sought after of the Satsuma wares. From about the 1890’s to the early 1920’s at least twenty and possibly more studios and factories were producing Satsuma Pottery wares. 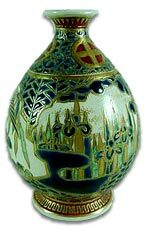 Much of this features low quality decoration and was destined for the European and American export markets. However, at the same time some independent Japanese artist studios were producing Satsuma pottery of the finest quality. The artist Yabu Meizan (1853-1934) had his own studio operating from about the 1880’s to 1920’s. He produced extremely high quality decoration and all his work carries his own Yabu Meizan seal, usually in gold. The Kinkozan factory (1645-1927) had it’s main production period approximately between 1875 and 1927 when the Kinkozan factory closed. Kinkozan IV’s real name was Kobayashi Sobei (1824-84) … and finding a good quality example of his Satusuma Pottery would be a very rare find indeed.